You can’t miss the bright red doors as you walk along the LINQ promenade. The look is that of a bright red British phone booth and the “re-purposed” doors lead you into a fast food spectacle of Vegas proportions. It’s fish and chips and there will most likely be a line. The line is mainly because the name on the marquee is that of Gordon Ramsay and in Las Vegas his name is synonymous with printing money at restaurants. Never mind quality, the Gordon Ramsay name brings in the crowds. That is not to say that he does not offer some memorable meals at his three other restaurants, Gordon Ramsay Steak, Gordon Ramsay BurGR and Gordon Ramsay Pub & Grill. It’s just that brand identity does well in Las Vegas and at Gordon Ramsay Fish & Chips they are relying heavily on reality TV’s favorite chef. I am going to be quite frank with you right now. I hated the fish and chips. Each of my visits I ended up with fish that was greasy and actually lost its crispiness in less than 5 minutes. I should note that the best fish and chips on the Las Vegas strip are actually at Gordon Ramsay Steak so that may be why I ended up with such disappointment in the product at a place specifically opened to deliver genuine “chippies” to Las Vegas. This version of Ramsay’s Fish and Chips is also available at his Pub & Grill at Caesars Palace. That does not mean you should avoid Gordon Ramsay Fish & Chips, just be ready to order a beer with your meal to make up for the extra grease. You should however have the chicken, yes, the chicken is pretty special. Also, make sure to sample the curry & mango sauce as well as the Sriracha Aioli, they both do wonders to spruce up the main dish. Gordon Ramsay Fish & Chips is a convenient fast food fish and chips joint except for the long line and the wait. The dining room has enough space for just under 20 people and if you don’t mind standing you can have a quick comfortable lunch in the dining room. Counters both in side and out allow you to have a meal on the go. I am not entirely sure I would want to eat these fish sticks on the go because that would prevent you from dipping into the sauces. Believe me, I tried walking and dipping and I am not coordinated enough to pull that off. How’s The Food at Gordon Ramsay Fish & Chips? Even though I want to bash the fish and chips at Gordon Ramsay’s new restaurant I should point out that there is a time and place for everything. After a night of serious drinking the greasy fish actually tastes great. I had conversations with others who said they “loved” them and another patron said “these are the best fish and chips I have ever had.” I may be in the minority in my lack of enthusiasm for the dish. All is not lost as the menu does have a few treasures to try. 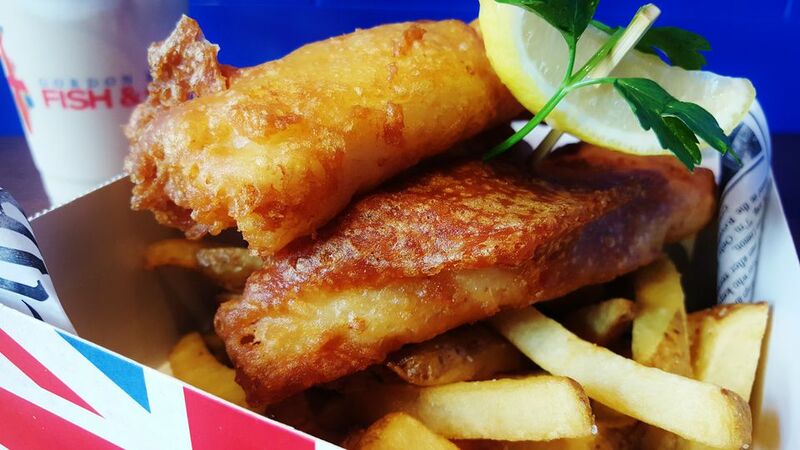 The Fish & Chips are the signature dish so you should try them. They want you to know that it’s not only sustainable but it is flown in fresh daily. So yes, the fishing practices are good for the environment but the carbon footprint is still huge as I can imagine there is a jet in Alaska waiting to bring a few pieces of cod to Las Vegas everyday just so that someone can enjoy a genuine British snack. The chicken and chips are a hit. As if some of the grease is left on the dripping pan the batter is a bit crispier and the combination of chicken and batter work. The chips, what we call fries are worthy of their own spot on the menu so make sure to order a plain set and some with the crisp chorizo and chipotle. These are some divine fries. You will need a shake and for the life of me I cannot choose between the Biscoff shake and the sticky toffee shake. Both will take you into a sugar coma but you must have them. You should visit Gordon Ramsay Fish & Chips with friends and try a family style meal where everyone samples different items on the menu. With sausage, shrimp, chicken and fish being fried up it is a friendly place to get cozy with comfort food. You’ll need beers and you’ll need shakes.